The remaining 40 helicopters, which were purchased under a contract in 2012, will be supplied to the customer by the end of 2015. The helicopters will be used by VVIPs during India’s up-coming election season. Russia has delivered the first batch of 19 Mi-17 V-5 military transport helicopters to India, as part of the contract to supply 59 helicopters of this type, an official representative of the Russian delegation at Singapore Airshow 2014 told Itar-Tass. The remaining 40 helicopters will be supplied to the customer by the end of 2015. The contract was signed during Russian President Vladimir Putin's visit to India in December 2012. The contractor is the Kazan Helicopter Plant (KVZ), which is integrated in the Russian Helicopters holding. In late 2013, KVZ executed the previous large helicopter contract with India signed in 2008, under which it supplied 80 MK-17B-5. The new Russian MI-17 V-5 helicopter is an upgraded version of MI-8/17 which Russia supplied to India before. It is powered by new VK-2500 engines, has a larger payload capacity, modern avionics, an airborne weather radar, and a night vision goggles compatible cockpit which allows for using these helicopters in operations by special task forces. In May 1999, during Operation Safed Sagar, the Mi-17 was used in the first air phase of the Kargil War by the IAF. The helicopters will most likely be used to transport India’s VVIPs during the election season. Sources tell RIR that the Special Protection Group (SPG), the elite force which handles the Indian Prime Minister’s security, has cleared the helicopters to transport the head of the government. The Mi-17s assume special importance since they will be used in place of AW101 choppers. The Indian government cancelled an order for 12 AgustaWestland AW101 choppers, over corruption allegations between Italian businessmen and their Indian intermediaries. Russian Helicopters is now actively marketing the MI-38 model in countries of the Asian-Pacific region. 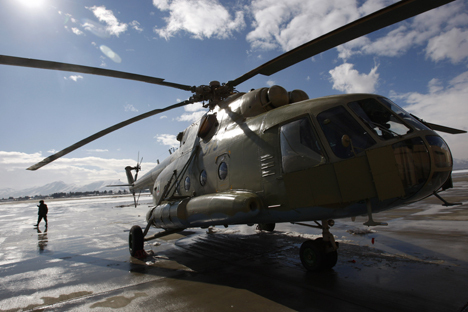 The Russian producer plans to sell helicopters in the region with Russian-made engines.